I live in Detroit Michigan and we have different groups of volunteers to try and clean the streets of Detroit. The group that I participated with went out once a week and picked a new lot to clean up. 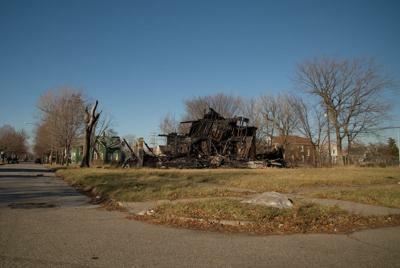 In Detroit there are over 4600 vacant lots just in the downtown area alone not including the outskirts. We would pick up the garbage, pull some weeds, recycle the plastic and dispose of all the used tires. Even though we had to pick a new lot a week if we went back to the same lot after 2 weeks, and it seemed like it went right back to the way it was but we won't stop until people get the picture that we will help to clean up the streets of Detroit. It will take us as long as we need but we will make sure that these empty lots will be something special. We want new business and homes to be built here and build up the motor city to what it has never been. And as long as we get volunteers we will continue to grow. This economy will not get any better if we don't keep up on the things that don't seem important but are. So anyone on any city who reads this at least pick up a piece of paper off the ground, if someone drops something speak up and ask them to pick it up. This world will only get worse if we don't help it get better. Thanks for sharing your optimism and sense of responsibility for your environment. You are experiencing something that is very common all over the U.S., which is the tendency to litter wherever the trash will be tolerated. In almost every neighborhood and on most stream banks, if people consistently pick up trash as quickly as it appears, over time there is less and less trash. The dynamic seems to be that when property looks neat and cared for, others tend to respect that. However, one piece of debris tends to attract more dumping. A clever national campaign is needed to market the idea of protecting your environment by carrying your own trash to a proper receptacle. Even then, if a neighborhood is depressing, we expect more littering and other bad behavior than in areas where there is a tidy appearance. This does not mean that a neighborhood has to be fancy or wealthy to be well maintained. What is required is a culture of community cleanliness and self-regulation. To understand that cultural shifts can and do occur, simply look at how attitudes toward tobacco use, spanking children, mothers working outside the home, women wearing pants to church, interracial marriage, and many other phenomena have evolved over the last fifty years. Let's keep working in our local communities until it is the norm once again to carry our own trash until we can dispose of it properly. We can make Detroit and every other city look better, whether or not large economic forces make our housing market strong or weak. Join in and write your own page! It's easy to do. How? Simply click here to return to Share Stories Invitation.